The same way wall-to-wall carpeting, hardwood, and laminate improve your interior, stamped concrete improves your exterior. This versatile look allows you to replicate stone, brick, and other paving materials without the need to actually lay down stone or brick. Take your stamped concrete one step further and stain it! Staining stamped concrete creates a personalized style and appearance that also adds increased curb appeal! Why should I stain stamped concrete? Concrete stains come in a variety of colors to match your outdoor decor or personal preference, giving you endless design possibilities to liven up dull, gray concrete. Unlike paint which completely covers a surface, stains are partially transparent. It reacts with your concrete in different ways to produce subtle variations in tone. Composition, age, and porosity all influence the way your concrete absorbs stain. Be mindful of your concrete’s present state before deciding to proceed. Can I stain any stamped concrete? You can stain stamped concrete regardless of whether it is old or new. However, you should never stain concrete that is spalling. Spalling (peeling or flaking) occurs when moisture in the concrete forces its way out, causing the slab’s surface to crumble. You want a clean surface, rather than cracked, uneven, or grimy concrete. Staining a damaged surface won’t improve the appearance of your concrete nor will it permeate the slab well enough to absorb the color. As your primary source for concrete maintenance, Bravo! 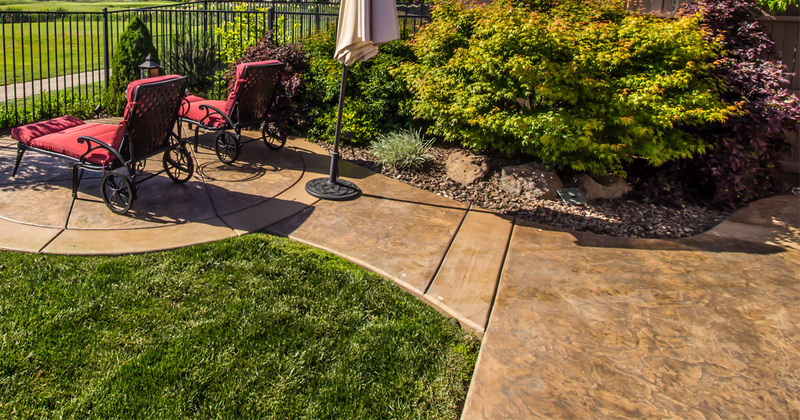 Concrete Maintenance is committed to rejuvenating your outdoor surface. In addition to staining stamped concrete, Bravo can level uneven concrete and pressure/ power wash away unsightly dirt, grime, mold and mildew, fungus and algae, oil stains and more with our eco-friendly biodegradable detergents that won’t harm you, your pets, or your landscape. The colors produced are durable and long-lasting, but just like your concrete, it will fade and wear away as the concrete suffers regular wear-and-tear due to foot traffic, weather, or lack of maintenance. Clean your concrete periodically to prevent unsightly grime and organic material from forming and seal your stamped concrete to preserve its beauty and extend its service life. Contact Bravo Concrete Maintenance today to get started!